Greuwel der vornahmsten Haupt-Ketzeren, So wohl Wiedertäufer, als auch andern (Leiden, 1608), is a translation of a Latin work published in the same year: Apocalypsis insignium aliquot Haeresiarchium, by an unknown author who is indicated by the letters "H.S.F.D.M.D." Besides the Latin and German versions, there are also three Dutch editions of this book: De voornaemste Hooft-Ketteren, Die haer in dese tijden so in Duytslant als oock in dese Nederlanden opgeworpen hebben (Leiden, 1608); Grouwelen der voornaemster Hooft-Ketteren (Leiden, 1623); and a reprint of the latter under the same title (n.p., n.d.). With the exception of this last version, all four editions differ from the original. An English translation appeared in 1655. 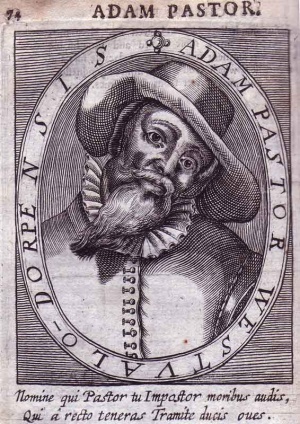 The Dutch edition of 1623 contains a chapter on Obbe Philips, and in an appendix some information on Menno Simons, Dirk Philips, and their followers. For Mennonite history this book is of no value, but the 17 engravings by Christoffel van Sichern which these books contain (the first Dutch edition has only 9) are valuable. Among these engravings there are portraits of Thomas Müntzer, Balthasar Hubmaier, Hans Hut, Ludwig Haetzer, Melchior Rinck, Melchior Hoffman, Jan Matthijsz van Haarlem, Jan Beukelsz (van Leyden), David Joris, and Adam Pastor. Menno Simons and Obbe Philips are not represented. The portraits of course have no guarantee of historical verisimilitude, since they were all made many years after the death of the subjects, and of all but one there were no contemporary representations. Zijpp, Nanne van der. "Greuwel der vornahmsten Haupt-Ketzeren." Global Anabaptist Mennonite Encyclopedia Online. 1956. Web. 22 Apr 2019. http://gameo.org/index.php?title=Greuwel_der_vornahmsten_Haupt-Ketzeren&oldid=105439. Zijpp, Nanne van der. (1956). Greuwel der vornahmsten Haupt-Ketzeren. Global Anabaptist Mennonite Encyclopedia Online. Retrieved 22 April 2019, from http://gameo.org/index.php?title=Greuwel_der_vornahmsten_Haupt-Ketzeren&oldid=105439. Adapted by permission of Herald Press, Harrisonburg, Virginia, from Mennonite Encyclopedia, Vol. 2, p. 578. All rights reserved. This page was last modified on 9 January 2014, at 13:59.